People visit Sabah, West Malaysia to see the 4,000 meter peak of Mount Kinabalu, the turtles, orangutan and proboscis monkeys and the beautiful off shore islands. I got to see the mountain in the distance, but the rest of Sabah will need to wait for later as this was pretty much a working visit on behalf of TWR. I met up with my friends and ministry partners, Bill and Sharon and enjoyed a three day stay at a quiet little hotel on the coast where we spent many hours planning out some joint activities for the next few months. My partners have been in Canada with some pressing family emergencies the past few months, and this was our first chance for us to get together. We chose Sabah in the hopes of establishing some future partnerships for projects there. 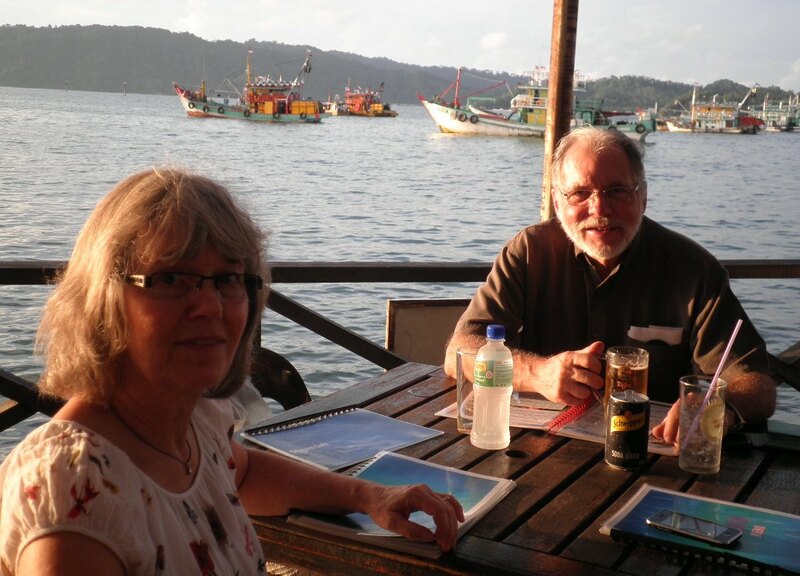 We explored the possibility of collaboration with several couples who are currently working in Sabah, knowing that this work can take years to grow to anything meaningful. However, Bill, Sharon and I did decide that in January we will proceed with the next week of training in Cambodia with our Cambodian partner, RHAC, and this will be followed quickly by the annual CHE Working Group meetings in Manila. On Saturday we went out for an early morning walk on the beach and discovered that at low tide we could walk over on a sandbar and check out the next island. This is undoubtedly a beautiful part of the world which I look forward to exploring some time but I have to admit that the clouds of mosquitoes constantly swarming around me was a little off-putting. Dengue fever is not something I want to explore! We followed this up with a twenty minute, hair raising trip in a packed, mini-van that got us into the capital city of Kota Kinabalu. Our first impression was of a rather boring concrete sprawl of squat office towers and utilitarian shops. But closer to the ocean there is quite a lovely waterfront where you can take advantage of a good variety of restaurants. As always I was happy to get back to our little condo in Kuala Lumpur. Steve still has some tidying up of the term to do: marks to be approved and graduation details to be worked out. But there is no doubt that the pace of our lives is going to be slowing down a bit for the next couple of weeks, and we are both looking forward to spending some time together to prepare for Christmas, our fifth in Malaysia!